Above: Focus beyond the snow, looking ahead instead—to sunny fairways and funds raised to support Iowa children’s charities. Warm thoughts on this winter’s day: Let’s think about golf and charity. Variety – The Children’s Charity of Iowa was named this week as PGA Tour Champions’ “charity of the year” and an official tournament charity partner of the Principal Charity Classic. As charity of the year, Variety will receive a $30,000 donation, which will be used to help fund the construction of the inclusive Variety Star Playground at Riverview Park, Des Moines’ second park with adaptive equipment for children with special needs. The golf tournament returns May 28-June 2 to historic Wakonda Club in Des Moines. 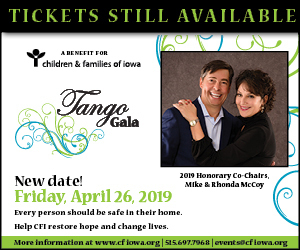 It has raised more than $17.7 million for Iowa children’s charities since 2007. Last year, the tournament touched the lives of more than 130,000 children statewide. Want to help? Volunteer registration for the tournament opened Jan. 21. More than 1,200 volunteers are needed, says Jenny Fields, tournament manager. A full list of volunteer categories, including many that do not require knowledge of golf, can be viewed at principalcharityclassic.com, where you also can register to volunteer.